Located on the top of the "Bulbul" mountain 9 km from Ephesus, the shrine of the Virgin Mary enjoys a marvelous atmosphere hidden in the green. It is the place where Mary may have spent her last days. Indeed, she may have come in the area together with Saint John, who spent several years at Ephesus to spread Christianity. Mary preferred this remote place rather than living in the crowded town. The house is a typical Roman architectural example, entirely made of stones. In the 4th century AD, a church, combining her house and grave, was built. The original two-story house consisted of an anteroom (where today candles are lit), bedroom and praying room (Christian church area) and a room with a fireplace (chapel for Muslims). A front kitchen fell into ruins and was restored in the 1940's. Today, only the central part and a room on the right of the altar are open to visitors. From there one can understand that this building looks more like a church than a house. Another interesting find is the "Water of Mary", a well source to be found at the exit of the church area and where a rather salty water, with curative properties, can be drunk by all. Paul VI was the first pope to visit this place in the 1960's. 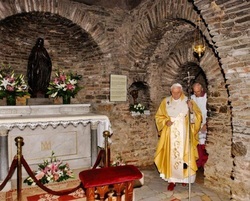 Later, in the 1980's, during his visit, Pope John-Paul II declared the Shrine of theVirgin Mary as a pilgrimage place for Christians. It is also visited by Muslims who recognize Mary as the mother of one of their prophets. Every year, on August 15th a ceremony is organized to commemorate Mary's Assumption.